Gareth, still 450 ppm? I think I recall asking a while back about Hansen’s 350 ppm and you said you’d address the question of level sometime. I realise that in view of what may be looming even 450 would be welcome, but the truth seems to be that we need an actual reduction from where we are at present. Although for some time I’ve been won over by Annan/Hargreaves’ Bayesian work on climate sensitivity(S). It hasn’t comforted me much recently. With sufficient carbon cycle feedbacks it may not matter much if S is ~3degC rather than a more alarming (headline grabbing) higher figure. I’m still not convinced this CO2/CH4 feedback will be fast on policy timescales. However once started it will be self-reinforcing and probably unstoppable (from my understanding). The in-the-pipeline warming we’re committed to, plus the timescales required for human emissions reductions seem to me to commit us to changing the whole planet. Thanks for the heads-up to Tamino’s blog, a typically excellent post. My primary short term (coming decades) concern about the Arctic warming remains precipitation changes in the Northern Hemisphere (and Southern?). And the US is suffering drought. Also Australia, as recently covered by Tamino. There already seems to be a pattern of drought in the areas projected to experience drought by 2100. In those GFDL models Arctic summer ice is largely gone by 2085. We already seem to be ahead of that, and we’re seeing an ahead of schedule pattern of drying suggestive of the modelled pattern (suggestive but no more). How much of the 2100 projected change is due to global warming, and how much due to Arctic ice loss? The two factors are probably intertwined, not just superimposed patterns. Are we already seeing the early climatic impacts of the early loss of arctic ice? With the amount of thinning so far there should have been an increase in water vapour, from my reading that’s key to “teleconnecting” regional changes in the Arctic to the wider atmosphere. Certainly for a few weeks now the HRPT infra red images of Northern Canada have been unuseable for viewing the ice due to haze sourcing IR from higher than the surface. But I don’t know if this is typical or not, as I lack an archive of past years. Tidied up your links, C.
Thanks for the rainfall projections. They fit with my intuitive response (more water vapour = more precipitation) and that of the scientist in the Nature blog (Update 2 above). It’s interesting to remember that people were whinging about global cooling because of a very snowy winter in parts of North America last winter, whereas that’s what you might expect to happen as the ice disappears. Note also that Norway’s winter was the fourth warmest on record, but also the snowiest. The impacts on the general circulation (the teleconnections, if you prefer) can be marked – as we see from the NOAA plot in the post. Changes in the “pattern” of weather bring climate changes, and I do think we’re seeing those already (which is what Stu Ostro and Jeff Masters have been posting about). What concerns me is that we now have evidence that there are rapid climate flips in the current generation of models that have been overlooked in the inter-model averaging process. The observations suggest that we’re seeing it happen now. It’s possible that in five to ten years the NH climate will have been radically transformed, and the physical, environmental, economic and social impacts of that will be felt round the globe. If there’s an upside, it’s that this change might be dramatic enough to make policy makers get serious about emissions reductions, but by then it will be too late to do much to stop the carbon cycle feedbacks. I hope you’re right about the pace of those, but re-reading my post about methane and clathrates, I’m not so sanguine. Stupid question – to save you time tidying up – what’s the format for links? I’ve re-read your “Gas, Gas, Gas” post, still not sure it’ll be fast enough to create a catastrophe in a human lifespan. But I’ll re-read the Archer paper in light of Shakhova and get back to you. If I believed that an abrupt and massive event like this were imminent I’d want to arm myself to the teeth and “head for the hills”. Reading the Archer article, I can see why you’re more concerned with “chronic” releases of methane, rather than abrupt. I guess that “abrupt” in geological terms is rather a long time in human years. How bad it might get is another one of those unknown unknowns, but one that has the potential to make any actions we take irrelevant (or a lot harder). That’s exactly how I see it, we’re at least committed now, as it seems likely we’re at the Arctic tipping point (so that can’t be stopped) and the warming will be an inevitable consequence. I say “at least” committed to chronic release because Shakova (abstract) seems to address Archer’s point in the last paragraph of the abstract. So I know think Archer suggests that the whole lot won’t be likely to go at once, but Shakhova suggests enough could go to be of concern in short timescale (handwaving because I don’t know how long). So I think you can start worrying again. I’m watching Beaufort Sea and along the Archipelago coast on today’s Cryosphere Today (Polar View) and QuikScat (Ocean Masked). Time will tell if these are data blips, but recent Easterlies across the Archipelago may have had an impact on the ice. This might be reflected in Beaufort’s area at Cryosphere Today (but that uses same source as their Polar View). CW, Archer is talking about clathrates globally (most of which are very deep) whereas Shakhova is talking about the limited case of the East Siberian Shelf, noting that per her calculation only about 150 Gt is prone to release. There’s about triple that just in the Siberian yedoma (per a new paper last week), e.g., so long-term the land part of the problem is the larger one, but what concerns me about the ESS clathrates is that they could be subject to very fast release by the same warming currents that are presently melting the sea ice from underneath. That said, I have no idea what that 150 Gt would actually do, or for that matter what the full 1 Tt or so of Arctic methane would do if released over the course of a couple of centuries. I’ve never bothered with the numbers stuff, so I’d be a little shaky on even doing the basic forcing calculation for the ESS methane. Would one of you be able to? I think I mentioned in the other thread that I emailed David (Archer) as soon as the Shakhova stuff came out, and from his response it sounded like he wasn’t aware of it (which was surprising). He did sound willing to do another post on all of this, but who knows when he’ll be able to. I hesitate to push him on it again since such things are after all purely extra-curricular for him. OTOH it might help if he heard from others. While I’m on the subject, remember a couple of months ago when there was a fair amount of attention paid to a paper pinning the snowball earth meltdown of 600 million years ago to clathrates? The publicity included much discussion of how this showed that such a transition could result in a similar shift today, which is weird since it’s not true. Oddly the PETM and the similar Toarcian event didn’t even get mentioned, at least in the coverage I saw. And then Shakhova got zero coverage outside of Der Spiegel. Go figure. Re the Arctic sats and other data, Wayne Davidson knows that stuff inside and out, so it would be nice if he could be convinced to do regular updates in a blog format. Her abstract suggests that 50Gt could be released “abruptly”, increasing methane levels by a factor of 12, ie from about 1.7ppm to 21ppm. Over short time scales, methane has a global warming potential of 72 (over 20 years – 100 year figure is 23-25), so the near term impact of a release on that scale would be equivalent to about 1500ppm of CO2. “Catastrophic” seems a mild description. If we suppose that the 50Gt releases at a rate of 0.5Gt/year, that would increase atmospheric CH4 by a factor of 0.12 in in the first year, about 0.2ppm/200ppb, equivalent to 14ppm CO2 per annum. On those figures, if the ESS begins to bubble in earnest, we are – to coin a phrase – f***ed. Anyway, that sounds bad enough, although it would still be interesting to see the details of how such a sharp transient would actually affect things. Trying to think it through conceptually, is it possible that the atmosphere would warm so quickly that we would see a temperature spike due to the oceans not being able to take up the heat quickly enough? Regardless, I can’t imagine somebody hasn’t run this through a model by now, so it seems exceedingly peculiar that nothing has come out on it. Oh what the heck, I’ll email Shakhova and ask her. So I guess the big question is whether she’s completely out to lunch on the vulnerability of the clathrates. My impression is that there haven’t been enough obs to know for sure whether the present level of emissions represents a serious increasing trend. There’s a Canadian team working out there this summer as well, so in a few months I suppose we’ll know if there’s been an obvious increase. Note my correction above, Steve. The plume would be intemse enough to have local heating effects until dispersed into the rest of the atmosphere. Local effective concentrations would be well above the global average, so you could get intense local warming that would reduce (eliminate?) winter freezing in the area. The local hotspot would therefore be a seasonal, and then perhaps annual feature that would likely have an impact on the general circulation. That’s enough wild-assed guessing for today… back to work. It slipped past me at the time, but it turns out methane levels have started rising again after being fairly stable for a while. I tend to stay away from numeric calculations because I’m all to aware of how little I know (regards asumptions etc). “The band saturation for CO2 makes CO2 a less potent greenhouse gas than it would be if we had no CO2 in the air to start with. Letâ€™s revisit our comparison of the CO2 and methane as greenhouse gases. Methane had a disadvantage because its absorption band sort of fell in the suburbs of the earth-light spectrum whereas CO2 fell right downtown. This allows methane increases to directly impact IR fluxes at sea level, whereas CO2’s primary effect is in the mid/upper troposphere. I still don’t subscribe to Alastair Mac’s idea of an immediate transition to ice-free Arctic, but this could slow the re-freeze season at least, possibly impact winter thickening of the ice. I agree with you both, this may be very bad news for rates of warming in continental interiors. Archer is talking globally, but does make specific points about the Arctic basin. The reasons he sees for time lags in sediment warming seem to apply there as well. My concern about ocean warming is mainly centred on the ocean surface warming found last year, with the potential for increased wind driven vertical mixing of the ocean. The Arctic is experiencing more storms due to more water vapour, and an ice free ocean allows greater wind-ocean mechanical energy coupling. I emailed Wayne last night to let him know about this conversation. I’ll go back and re-read the Archer article, but the concern I have is that he didn’t take into account the warming current intrusions that were the key to Maslowski’s apparently-successful RCM projection of sea ice melt (noting that he says the GCMs failed because of being unable to resolve these currents). As the ESS clathrates are so shallow (40 meters average IIRC)), currents capable of rapidly melting the sea ice seem like a real hazard. I’ll ask Shakhova about that. I’ll be most interested to hear what she has to say. Speaking of Maslowski, he has some new papers in the pipeline. Not sure when they’re going to appear, but they’ll be worth a read. Do either of you know what Maslowski’s projections say about winter extents? To be frank I’ve read little more than media articles and a 2006 presentation of Maslowski’s. I was reading the expert outlooks from ARCUS yesterday. Well worth reading them all. I think the winter ice is expected to more or less recover, although of course forming later, melting earlier and staying thin, a little bit more with each passing year. IIRC this has been stated in a few of the published GCM studies. Maslowski had plenty of opportunity to say something different last fall and didn’t do so, from which I gather that his results show nothing fundamentally different (other than being on a faster track). BTW, on the BBC site there’s some audio of Maslowski from last fall’s AGU meeting. Mark Serreze’s lecture (available on the NSIDC site) is also worth a listen. The late fall and early winter saw lots of open water in Amundsen gulf. This was due to cyclones tracking along the open water area from the Chuckchi Shelf through the Southern Beaufort Sea to Amundsen Gulf. The cyclones kept the ocean surface very rough (figure 2) and contributed to a large ocean to atmosphere heat flux. Our in situ measurements showed that the surface mixed layer contained a lot of heat due to the long period of open water in the summer and fall of 2007. This period of open water and very thin ice continued through until about mid to late December when things began to consolidate. As noted at the end of the article Gareth links to in update 2 above: “Models can’t usually represent storms because they happen on too small a scale.” Yet, despite not being amenable to modelling these cyclones are still having an effect that may impact the region’s climate in a real sense.
. They’ve taken an ensemble with members 1-7 where they’ve forced from current ice conditions with NCEP/NCAR data for the years 2001-2007. Zhang finds that based on the average response to previous years weather the extent this year is below 2007, but only last year’s weather produces a massive crash. Cobblyworlds, you say that the Arctic is experiencing more storms due to more water vapor, yet according to NOAA the global level of water vapor is at an all-time low. I realise there are patterns that differ globally, so can you tell me where you got this information? I don’t think that’s correct about the water vapor, Sidney. Source for that? Come to mention it, though, that statement from CW doesn’t sound quite right either (although I’m no expert and may not have this straight). IIRC the relationship is at least more complicated. Do you have a cite for that, CW? Aha, Sidney has been to visit our friend Anthony Watts. In general, Sidney, whenever you see a claim that data (especially, as in this case, NCEP reanalysis data that FYI has been run through a climate model to fill in the gaps in observations) located in an obvious place on a NOAA site has somehow been missed by climate scientists and will overturn some major aspect of the science in some completely obvious way, expect that a mistake has indeed been made… by someone other than the climate scientists. AW keeps doing this sort of thing because he just *knows* that climate science is a huge conspiracy and that with enough perseverance a none-too-smart or educated guy like Anthony can overturn the whole apple cart. At this point he’s starting to remind me of the Coyote in the old Warner Brothers cartoons. I hate it when I’m asked for a reference and I find I can’t recall my source. By Googling I have found instances of the “more storms” part e.g. “Cyclone Activity Has Intensified in the Arctic” ftp link to pdf. However that paper states it’s due to a shift in storm tracks, not increased water vapour. And so far I can’t find the reference to water vapour. However for a future with smaller ice cover more water vapour will enhance any storms that are about (releasing latent heat), and baroclincity (where density depends on both pressure and temperature) is a key ingredient in storms. Baroclinicity is enhanced by humidity. You can expect more water vapour becuase thick ice insulates sea and atmosphere, and broken ice pegs the sea surface to 0degC. When an area is free of ice it warms and evaporation increases significantly, as does the ability of the atmosphere to hold water vapour as it warms. From a combined analysis of satellite, radiosonde, and surface humidity data we cannot reject the hypothesis that global and northern hemisphere mean relative humidity has remained constant, in other words specific humidity has increased in response to surface warming close to the rate predicted by Clausius-Clapeyron. pdf here. i.e. they can’t reject the hypothesis that the change is due to warming. The late fall and early winter saw lots of open water in Amundsen gulf. This was due to cyclones tracking along the open water area from the Chuckchi Shelf through the Southern Beaufort Sea to Amundsen Gulf. The cyclones kept the ocean surface very rough (figure 2) and contributed to a large ocean to atmosphere heat flux. Our in situ measurements showed that the surface mixed layer contained a lot of heat due to the long period of open water in the summer and fall of 2007. This period of open water and very thin ice continued through until about mid to late December when things began to consolidate. Once the ocean was capped the ice grew relatively rapidly. Such cyclones are below the resolution of GCMs. That’s why I was asking about Maslowski and the winter. The highest of the expert assesments (Harry Stern 5.56M km^2) is not really an assesment in the spirit of the others. It’s a test of “linear persistence”. From your link: â€¦&level=300â€¦. Thatâ€™s in the stratosphere, which is cooling. It helps to look in the troposphere (where thereâ€™s warming) rather than at 300mb in the stratosphere. Yes the dataset goes up to 300mb, but you selected 300mb as the analysis level. Thanks for that, CW. I’ll bookmark the link. It’ll be interesting to see how Watts disappears this error, and whether your comment ever sees the light of day (noting also that he’ll probably take your salutation as an intentional insult). Now that you mention it, though, what a dim bulb he is. It turns out I didn’t need to copy it here, to his credit Watts let it through. Ooops sorry! Mr Watts, with an â€œsâ€. Thanks for the clarification. Anthony Watts has also clarified, apparently. Getting back to the Arctic ice extent, if you study the graph you’ll see that the rate of fall this year is not as large as last year’s. I’m of the opinion that we are not going to get a fall. If you look closely here http://arctic.atmos.uiuc.edu/cryosphere/IMAGES/sea.ice.anomaly.timeseries.jpg you just might get the impression that it should really have already showed. looks like you’ve got another taker for your bet Gareth. Clearly a reference to those other than his aforementioned cheerleaders. He’s carefully sidestepped. His post still looks misleading to me. Actually, Sidney, this year it’s dropped more sharply, but the question of whether it’ll continue to do so won’t really get answered for a few weeks. 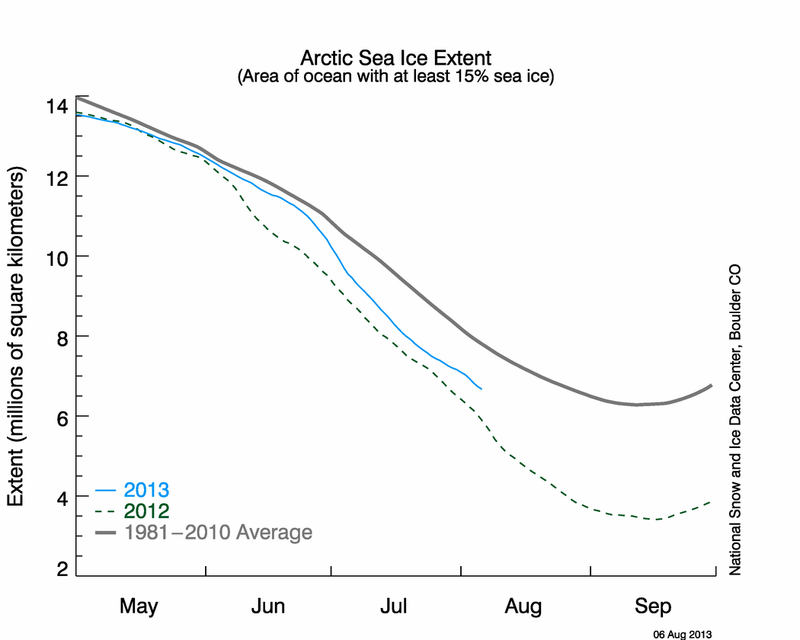 Bear in mind that the ice is more vulnerable than last year. This is probably a better graph to be looking at. Yep, CW. It requires a bit of interpretation to understand that the post was completely wrong, and the camp followers over there are a bit short on interpretation skills. It also appears that he did his best to get up some other posts as quickly as possible so as to reduce attention to this one. I still think that part of Watts’ problem is that he didn’t understand the nature of the NCEP reanalysis data. Thanks for the info on Arctic water vapor. I wasn’t trying to imply that you were wrong, just that there’s more involved (isn’t there always). I have no direct information as to Maslowski’s findings on this point, but IIRC the GCMs all do find the increased storm activity going forward. Since Maslowski did say that the only major difference between his RCM and the GCMs was the warming currents, presumably that means the storms weren’t different. After pondering and googling today I suspect the sort of activity I refer to in the CFL quote can be reasonably addressed in a 40-50km grid RCM. The crack shown across the Archipelago in fig 5 of NSIDC 3 June 2008 is of that sort of width. Can you enlighten me about your point regards the NCEP data? CW, not only is the NCEP reanalysis the most-used climate data set, it’s a GCM product (data is run through one to generate mssing values and eliminate outliers). It’s impossible for there to be surprises in it of the sort Anthony was hoping for. In a lot of ways I think the biggest conceptual problem for amateurs trying to study climate science is acquiring a sense of how vast the field is. IMHO Anthony just plain isn’t bright enough to get that. Of course his notion of the science starts with it being impossible and a big conspiracy, so he places himself at a disadvantage in terms of understanding it. It’s interesting how common that sort of perspective is among both professional and amateur weather forecasters. I should have remembered about NCEP, I’ve never read what you say about it, but it has occurred to me that something like that must have been going on considering the Arctic/Antarctic coverage (the only context I’ve closely seen NCEP stuff in). The fatal flaw of many denialists is the unwarranted self-regard exposed by their initial conceit: “I’m right and all those scientists are wrong.” I now think of them as pub-bores. CW, see here re the NCEP reanalysis data. Basically it’s a constantly updated consistent set of atmospheric data of all types going back to 1948. And in today’s news, that Jim Hansen is starting to look a little too prophetic for my taste. Speaking as someone who reads both sides of the debate I have to say that although ‘denialists’ (hate that term, Cobblyworlds) do indeed think they know better than scientists, I am of the opinion that scientists haven’t got it right either. I see climate change very clearly myself. For those who wish to know, I think carbon dioxide hasn’t turned out to be the great forcer we all thought it would be 10 years ago. Who could have foreseen that we would see a stagnant temperature level for nearly a decade? So I think we should be very careful about making predictions in that light. The alarmist predictions may backfire badly. And we have to be careful with the truth also. An example of which is the BBC link given above. The headline screams that Arctic melting is even worse than last year. Unless I’m missing something the graph on that site doesn’t show that. Yes the year began with more ice, but that doesn’t really justify the claim as such because it could equally well be just variance. In other words that red line could equally well creep above the blue again. Which leads me back to the Arctic. Is the melting really as a result of climate change? Because, if so, it was very abrupt when you look at past year’s data. Is it just part of a cycle? We have all seen reports of past Arctic melting, just 70 years ago. What I’m saying is that we have to be honest. If we berate skeptics but act just like them in reverse then we are not doing the debate any good at all. On another conversation here the troposphere is mentioned. I have read much on this myself, and cannot help but form the opinion that we are trying to make something fit which clearly doesn’t. Either John Christy’s data is wrong, or the theory is. And since Radiosonde data over the tropics confirms Christy’s results then I’m bound to say this needs attention. If the Arctic doesn’t melt this year too, then there will be some backfire. It’s bizarre that some are actually hoping it will in order to bolster their opinions. I would like to add a little bit on the rather surprising comments on Anthony Watts given here. Mr Watts has brought to light the sometimes awful and quite ridiculous placings of temperature recording stations. For this he should be given some respect. His latest, showing a sensor located on top of a 3-storey building, graphically illustrates that all is not what it seems in the debate on climate change. Sidney, it may seem fair and even-handed to give equal weight to “both sides of the debate,” but I would suggest to you that doing so is going to give you a false impression of the situation. This is science, not politics. Re Watts, there’s no science to back up his claim of large microsite bias. The Leroy “paper” he bases it on isn’t a paper at all, but a set of seat-of-the-pants maximums intended to be used for site selection. The photo effort actually has some scientific value, but he gets made fun of because he uses it as a platform for ridiculous claims. Re John Christy, I would suggest that you familiarize yourself with his extensive history of errors. Re the sea ice, it has in fact melted back more so far this spring, so what’s wrong with saying so? There’s on the order of half as much ice volume this year relative to last, which is why normal weather will give us a much sharper melt. Well, we can probably expect the transition from an interglacial to the next stable state with reduced ice (as I understand it probably with a smaller Antarctic ice cap only) to be a lot less energetic since there’s much less ice to melt now, especially in the NH. Unfortunately “a lot less energetic” doesn’t translate into pleasant given this new standard for comparison. IIRC Jim has been speaking in terms of at most decadal changes rather than annual changes, so we’ll have to see if he revises that in light of these results. I haven’t read the paper, but the idea that the atmosphere is capable of reorganizing itself anywhere close to that fast is new as far as I know. From the quotes relating to implications for the present, it sounds as if the authors may have been talking to some modelers. Steve. Thank you for your reply. It’s not that I think along the lines of equal share of the debate, it’s more that I believe this issue to be so complex that one needs to look at both sides to see what each are saying. Over the years I’ve seen pathetic attempts at blaming climate change. The most recent being the truly laughable “Stronger earthquakes blamed on global warming”. Let us not forget that even the New Years Day tsunami was also given a global warming tag by idiots. The climate change debate has holes in it, let’s not make out it’s clear-cut science. On that subject, I disagree that this is about science only. Oh, if only it were! Climate change is more wrapped up in politics than any other debate I have ever witnessed. You don’t seriously believe it isn’t? As for John Christy, I see no point mentioning his errors when we are talking about data which is mirrored by RSS and Radiosonde data. I appreciate your feelings on Mr Watts, but as a bystander I applaud his revelations on the absurd placings of temperature recording sensors. Re Arctic melt, we will soon see. Steve, what do you make of the Antarctic? I see that all the predictions are for a huge ice extent this year, even exceeding last year’s record. This isn’t snow-addition of course, but actual ice-build. Why the abrupt growth that is in direct opposition to Arctic melt? Sidney, I can see that you’ve succeeded in losing yourself in the details. My point about the science was to pay attention to scientific sources. If you go back and forth between the like of Watts and the earthquake guy you’ll never unconfuse yourself. If you want to know about the science, I suggest you (in this order) read The Discovery of Global Warming, the AR4 (as much as you can handle, but at least the synthesis report and the WG1 technical summary), the last year or so of posts at RealClimate, and finally the entirety of Coby Beck’s Skeptic’s Guide (vetted by climate scientists) over at Grist. Is that a big time commitment? Sure, but believe me it’s a whole lot less than Gareth, CobblyWorlds or I have put into it. Re the politics, of course it’s completely wrapped up. The problem with most denialists is that they came to the science with a pre-formed political view that they were bound and determined to not change. Occasionally one of them is able to rise above that, but it’s very rare. To be blunt about it, at this point you’ve succeeded in convincing me that you don’t understand the science and don’t care to. When you say things like “predictions are for a huge ice extent” in the Antarctic, all it does is confirm the prior evidence that you don’t know what you’re talking about. Could the loss of Arctic ice play a role in such an event? As far as I can see it’s possible (e.g. atmospheric teleconnections and fresh water flux changes). “One question is whether we can see the symptoms before big problems occur. Almost certainly not, if such an event were happening now it might be rightly considered weather, for example an extended La Nina, out of trend increase in Arctic Winter ice area… But I stress, I am not saying it is happening now. And we’re speeding down that road as there’s an increasing timelag between the controls (emissions and other human activity), and their effect, due to lags in the system. Watts is obsessing over piffling details, I consider his self-regard to be wholly unjustified. Have you read the GISS and CRU primary literature about how they make their datasets? Have you seen what impact last year’s US corrections had on GISS? GISS 2007 Summation, scroll down to Data Flaw, last section. Whatever impact people like Watts will have it will be negligible. Watts’ latest “correction” shows his real game – he just wants to sow doubt. Christy ignores error ranges to maintain his claims that models aren’t wrong in the tropical troposphere. As discussed by RealClimate recently. The scientists know that this is a real physical process (as do I), so if they call it wrong they will be shown wrong. The denialist fringe are not so constrained, do you think the prats that have been saying Lyman shows an ocean cooling that refutes AGW will now publish retractions? Last year I was not overly concerned e.g. here. I was wrong and have spent since then putting my understanding right. If you think referring to area/extent graphs is enough, try checking out the detailed data e.g. here also check out figure 3 of Nghiem 2007, 303kb pdf here. ARCUS Expert Assesments for May. Note that the 5.5 million km^2 prediction by Stern is not really a prediction, and as far as I’m concerned Bitz is wrong, if she’s right then it may well support the models’ projection of a decadal transition to seasonally ice free state. Which would be a relief. As for Steve’s comment about the amount of work involved – I have some 200+ papers I’ve read, 142 awaiting reading. That’s just the pdfs on my hard drive. I’m sorry to be blunt but I agree, so far my impression is that you have a lot of learning to do. Finally, politics – before my scepticism was dismissed by the science I was what’s best described as a “Thatcherite with Fukyama sympathies”. Now I see no way out, I think it’s too late and as there’s no political answer to either Peak Oil or Climate Change, I have no explicit politics to speak of. As you doubt the reality of our position I will leave the ongoing processes to address that doubt. Sorry, but I am too busy. Steve. Thank you for that. But I have read the AR4, realclimate, and many, many blogs on both sides of the debate, and will continue to do so. I’m not into science very much but have a good understanding, and constantly learning on the issue of climate change. Your last sentence is harsh and lacks explanation. Inform me why â€œpredictions are for a huge ice extentâ€ somehow confirms that I don’t know what I’m talking about. This flippancy and disregard was also meted out to HarryTheHat. Is it a thing with this forum? I got this from Department of Atmospheric Sciences at the University of Illinois Polar Research Group. Last year’s ice extent was greeted with great jubilation from climate skeptic blogs, and by all accounts this year another record will be set. So why do I not know what I’m talking about? Sidney, in your first comment above you made the unqualified assertion that “according to NOAA the global level of water vapor is at an all-time low,” making it crystal clear that you weren’t aware of the extensively-discussed state of the science on this point. In another comment you said “the rate of fall this year is not as large as last yearâ€™s,” which is clearly wrong. Just now you asserted that there’s a prediction of a “huge ice extent” in the Antarctic “even exceeding last year’s record” and then link to a page that says no such thing. FYI last year’s record Antarctic extent wasn’t “huge” and you’re not going to find a prediction of a huge extent this year from any credible source. I could add some additional points. The upshot is that you seem both careless and uninformed. This flippancy and disregard is because we take your position no more seriously than if you turned up here arguing that the earth is flat (refuted by observation), you have invented a perpetual motion device (violating the first law of thermodynamics), or you can ram 1Mbit/s down a 300-3400 Hz standard phone channel (violating Nyquist’s theorom). But you must understand that from where we stand the evidence has made your stance obsolete. The world and science has moved on. And I for one get the distinct feeling that in addressing the concerns of denialists I do little more than entertain the delusion that they have a point worth addressing. Thank you Cobblyworlds. However, I really don’t think flippancy and disregard is appropriate. I am constantly learning, despite having no science background at all. When I pose a belief based on my observations I don’t expect such retorts. And especially so when I base that belief on a credible source; being the University of Illinois Polar Research Group. You and Mr Bloom quite evidently know far more than I. But that is no reason to treat someone as a ‘flat-earther’. I am not a skeptic as such, but can see both sides of this issue. I’m afraid some can only see one. Looking from the outside I find it curious that ardent skeptics and enthusiastic-believers of global warming cannot see just how entrenched both are. If a climate scientist who doesn’t believe that carbon dioxide is resulting in the warming came on here, would you treat them as a flat-earther? Such a person would know far, far more that you and Mr Bloom about climate science. Just because he has arrived at a different perspective on climate change doesn’t make him a Creationist-equivalent. You have got to drop such terms as ‘denialist’ due to its connotations and realise that you cannot brow-beat people into your belief or treat them as fools. They just might see far more than you. And by that I don’t mean knowledge, but reasoning. I’d hear enough to be pretty sure before deciding whether they have a point. But if someone could demonstrate such an alternate explanation it would have to cover such a mass of different factors that the likelihood of that happening is tiny. It’d be like getting to the end of a 500 piece jigsaw with 10 pieces left and realising you got the first 490 in the wrong places! I have treated PhD’s and Professors with disdain and total disrespect, where they have earned it (e.g. I have caught such people repeatedly claiming papers show things that they do not – they didn’t expect someone to go check!). The term denialist is not intended to risk invoking Godwin’s Law. It merely refers to being in denial of some aspect of reality. Holocaust deniers and AGW deniers share a common trait of denial, but it is denial of totally different aspects of reality. Otherwise I do not see linkage between the two. I can’t answer for Gareth or Steve, but I’m not trying to persuade you of anything. Go ahead believe what you want. That people deny reality is not going to stop the ongoing process anymore than royal decree could stop the incoming tide. PS – your latest post – do you really think I’m unaware? – the Arctic is a sea surrounded by land, the Antarctic land surrounded by sea. I’m not going to ask why you think it would be of interest because I don’t care. Cobbly Out. Now, back to the issue at hand: The Arctic as a gateway to irreversible climate change…. CW. Is that what you think, that a melting Arctic really is a gateway to irreversible climate change? We know that waÂ­ter abÂ­sorbs more sunÂ­light than does ice, so a larger area of ice-free waÂ­ter would mean a positive feedback (warmÂ­ing). We also know that ocean cirÂ­cuÂ­laÂ­tions may well be driving warmÂ­er curÂ­rents inÂ­to the ArcÂ­tic. But isn’t it the case that the loss of Arctic sea ice may be down to changing atmospheric pressure and windflow patterns as well? And that these could well be natural? Although we no longer get reflected sunlight (as the ice is gone) does that have implications for the globe? It’s evidently not a runaway, as this has happened before, yet ice has reformed. On a different note, what do you think of the Petition Project? Not just a few scientists to treat with disdain, surely? CW. Getting back to your point on an ‘alternate explanation’ perhaps I can now see where you and I differ, and why I was right about being you being entrenched. What you are looking for then is an explanantion that is all-encompassing. You cannot evidently accept that ‘a portion’ might be right, and some wrong. Let me explain. This is a political stance adopted often. ‘The other side I don’t agree with, so all of their policies are wrong’. Do you see? You shouldn’t be looking for someone to blow away all your pet theories with solid arguments, because that’s never going to happen. Climate science is too complex for that. The cleverest climatologist in the world has huge holes in his understanding of how our climate system works. That’s half the problem! It would appear that carbon dioxide has been responsible for warming. However, it doesn’t follow that it will result in the predicted warming because our models aren’t good enough. When you look at Hansen’s Scenarios, what do you see? Scenario A has turned out to be way off. Scenario B was pretty good, and Scenario C was almost spot on, but both B & C assumed a reduction in greenhouse gases, didn’t they? To get back to my point, you shouldn’t be looking for someone to overturn all what you have learned for you to stop believing in carbon-based climate change, as that simply isn’t going to happen. What you should be looking for is an expert to say, ‘Yes, but carbon dioxide hasn’t turned out to be quite the forcer we thought’. I doubt very, very much that the Sun is going to be revealed as the cause of warming. However, I also doubt that (with the same level) carbon dioxide will turn out to be the cause. My appeal to you would be to be more skeptical, that’s surely the number one rule in science (maybe #2). My other piece of advice would be to consider that you might be wrong. It’s a sobering experience finding out that what you hold as true is wrong. I know; at my age I’ve witnessed it a few times. To use your jigsaw analogy, you may get to the end of the puzzle and find that the makers had wrongly put pieces in from another jigsaw. That doesn’t make your puzzle wrong, it makes it incomplete. And that’s what’s wrong with the debate on climate change. We don’t know enough, and we’re making out we do. Later you admitted it was just your own prediction. IOW you feel free to make things up. So not only do you make things up, you are indeed a denialist. Steve. Yes, it was my own prediction, I never said it was anyone else’s. Although having said that, I have read many blogs that are predicting a record year. So I’m a ‘denialist’ then? Yes, in the same way that Christians are atheists, since they don’t believe in other gods. If you’d have read with more care, you might realise that my underlying belief is that carbon dioxide won’t turn out to be the ‘sole’ cause. I had already said that it hasn’t turned out to be the great forcer we all thought it would be. So that makes me a denialist? Of what? What a curious reactive statement you make. I note you haven’t been able to admit your error on the Antarctic. That’s the difference between us Mr Bloom, I admit my errors. I’m still learning, whereas it is actually you who are in denial. Think on it. Those who cannot see another side have no place in science, and are future lambs. In other words, when you get older you may well be sheepish. Sid, you falsely accuse me of an error on the Antarctic just after I caught you in a direct lie on the same subject? That’s a bit pathological, isn’t it? Note that you referred to prediction*s*, so ix-nay on the odge-day. I’ve noticed that it’s quite common among denialists to feel that it’s acceptable to have that sort of loose relationship with the facts, and that it somehow shows their views to be more balanced. That’s tolerated in politics, but not in science. Sidney, Hansen’s scenario B and C both had increases in greenhouse gases. Link. If we can find ways to educate the opinion-makers and â€˜talking headsâ€™ in the mass media who are ‘educating’ us now. That could be a step forward in terms of successfully establishing behavior changes grounded in competence and improved reality-orientation. Let us the consider the way many too many economists, politicians and their super-rich benefactors who primarily govern the workings of the news media, report to us that Earth can indefinitely sustain people conspicuously consuming its limited resources the way millions of fortunate people worldwide are doing; but I fear these intelligent â€˜dreamersâ€™ have lost their reality-orientation with regard to human biological limits and the limitations of the bounded physical world we inhabit. The Earth is relatively small, evidently finite and noticeably frangible; it is neither an eternal provider like a motherâ€™s teat nor is it an endlessly overflowing cornucopia. Unlimited expansion of the global economy without regard to limits to its growth that are inevitably imposed by a finite world is an end-all strategy, I suppose. Obscene displays of consumption by self-seeking people with great wealth could be directly undermining the biophysical integrity of Earth as well as precipitating deleterious effects upon its environs. Please consider how scarce resources are being recklessly dissipated and global ecosystems relentlessly degraded at a much faster rate than the Earth can restore its resources and ecological services for human benefit. Unintended, pernicious challenges resulting from the unrestrained increase of per capita over-consumption of Earthâ€™s finite resources and the unbridled growth of economic globalization appear to be threatening to ravage our planetary home. Sidney, if you question the Fundamentalist AGW movement you will get called a ‘flat earther’ ‘denialist’ etc. From a well known left leaning paper, The Guardian (from the UK). Hansen’s own baby GisTemp has shown no Global (as a whole) warming for 7 years now. Keep questioning, and remember, sticks and stones will break my bones, names will never hurt me. Fragment, thanks, I haven’t had time to read that yet and have somehow managed to miss it on realclimate in the past. Steven’s contribution reminds me of what many see as the ‘real’ problem that will face us, over-population. Steve, no it wasn’t a ‘lie’. I have seen many predictions that this year’s Antarctic ice extent will be a record. They may not have appeared on what you’d say is a “credible” web site, but then given your comments here you wouldn’t believe anything unless it satisfied your ingrained belief. I know for a fact that it’s on ICECAP’s site as I only read it last week. The FACT remains that this year’s Antarctic ice extent will be yet another new record, and will be directly proportional to the discomfort of you and your fellow believers. We have insufficient warming of the troposphere, cooling of the oceans (ARGO), a sea level fall, and record ice extent in the Southern Hemisphere. All you have to cling to is the Arctic, with many scientists saying that even that isn’t due to climate change. And that’s even if it melts again, which it may not. You and CW have to confront the realisation that carbon dioxide doesn’t appear to be giving the warming expected. Until you accept that you’ll be sat on the seashore demanding the tide recedes. Thank you Peter. Of course, GISS is a bit of a joke now. It’s data is ‘out there’. With other data all showing far less warming, one is left with the feeling that their baseline and inclusion of proxy data makes it worthless. My only worry is that with Obama in power, Al Gore will be given a role to quietly sideline data from RSS and UAH, and even make the HadCRU come into GISS’s line. Only continued huge drops in temperature within the troposphere may start to convince some that something is up with our understanding of climate science. Sorry to interrupt this little sceptic-fest, but if GISS is “a bit of a joke”, I’ll just give up and close down the site. What a relief to know that wishful thinking is so powerful, and can solve all the world’s problems. Gareth. Then I suggest you do indeed close down the site. If you really think that GISS is indicative of global temperatures then you haven’t been paying attention. Have a looky see for yourself, and then decide. Remember their baseline and their use of proxy data, then go ahead and close down this site. Do you think (in any case) that land and sea temperatures are a good place to look for changes in climate? The oceans are, and so is the troposphere. And what do they say again? Oh yes, I remember. You need to stay up with the game. The old “oceans aren’t warming” line is so last week. 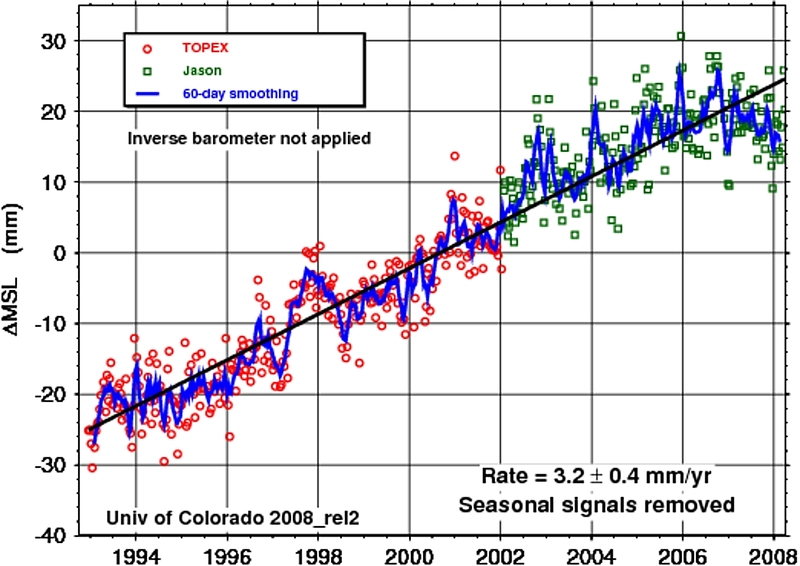 As for the tropical troposphere, I suggest you ask Roy Spencer why he doesn’t show the error bars on the data. Because, y’know, they overlap with the error bars on the model predictions. Meanwhile, your bluster about the Antarctic is just that – bluster. There have been no predictions of record extents from any of the scientists studying the ice, unlike the situation up north. Time for you to do some reading beyond the little nexus of crank sites. But I won’t be holding my breath. Gareth, what about the lack of warming from Hansen’s GisTemp for the past 7 years, or should I be arrested for being a denier. These are turning into the crank sites. People are steting to look thru you fundamentalist warmers. Always play the player, not the ball if we dis agree againt the religion. The problem, Peter, is that climate is not measured by the month or year, but by the decade (30 years is the climatological standard). The most recent ten year period is significantly (about 0.1C) warmer than the decade that preceded it. You might have a point if the next ten year period was no warmer than the current ten year period. But I would be willing to bet that it won’t happen. Care to put your money where your bluster is? Gareth. Some questions: a) Can you write without abusing someone? b) If the oceans haven’t cooled then why has global sea level dipped for the past 2-3 years? c) Are you stating on here for all the public to see that the Antarctic will not see a record level of ice extent this year? Can we see what a big brave man you are by answering that last question especially? My troposphere temperatures come from the UK’s Hadley center. Would you like to see them? http://hadobs.metoffice.com/hadat/hadat2/hadat2_monthly_tropical.txt The fact is that models don’t tally with what’s actually happening. Now you can deny that if you want, but then that would make you a denier, wouldn’t it Gareth? And now we discover that Jim Hansen has been ‘correcting’ UIHE temperatures in the wrong direction! http://www.climateaudit.org/ Could it get worse for you believers? Yes, and it will. Gareth. Your comment to Peter on the “last 10 years”. This http://icecap.us/images/uploads/ALL_SINCE_2002.jpg is for the last five years. What do you think will be the trend when the next five years data is revealed? a) Can you write without abusing someone? b) If the oceans haven’t cooled then why has global sea level dipped for the past 2-3 years? Really? You look mistaken to me. It goes up and down a bit, but the long term trend is rather obvious. c) Are you stating on here for all the public to see that the Antarctic will not see a record level of ice extent this year? Looks 50/50 to me. The Antarctic sea ice behaves very differently to the Arctic, for lots of obvious reasons, but it’s interesting to consider why it might be growing when the data suggests that the continent is losing ice mass. Could that lead to a freshening of the water around the edges, making sea ice easier to form? The work done over the last austral summer as part of IPY will be interesting to see. Gareth. Would you kindly point out exactly where I have abused someone? The trend for global sea levels was up, now it has fallen, and that can only be because of cooling oceans. Do you know of any other cause for it? The Antarctic is breaking all records simply because of the temperature! Look at the station records. Sid, your whole attitude (“Can we see what a big brave man you are”) speaks volumes. You clearly don’t know what a trend is. If you visit the link I provide, you’ll see that the trend over the full range of data is resolutely upwards. As for the Antarctic “breaking all records” that would include mass loss, would it? Gareth. Mine was a ‘response’ to your unwarranted slur that I am living in “cloud cuckoo land”. Try and debate an issue without casting stones. And I didn’t argue that there was a trend, what I said was that there has been a dip in ocean temperatures, and that it could only come from a cooling. Do you not understand that? If not, why are you commenting on climate change issues? Mass loss is a contentious issue. I assume you’re going to mention Grace. Only Grace’s data is not only insufficient, but also two years old: Anny Cazenave, from the Observatoire Midi-Pyrenees, France, said “Great uncertainty remains, mainly because of incomplete coverage by remote-sensing surveys, spatial and temporal undersampling, measurement errors, and perturbation from unrelated signals.” Then of course you should remember that the data showed an annual loss equivalent to 75,000 sq kl of 2-metre thick ice. I put it in that format to remind you that the rate of build is such that 1,000,000 sq kl MORE THAN LAST YEAR’S RECORD will most likely form this year. Do you see now? Dr. Semilitov and many others. finest climate scientist of the last twenty years. Again, thank you for your website Gareth. That will be this James Hansen, will it? No. More like this one (two, three). So what are you saying? In the last 2 years Greenland has started gaining mass? Think again abstract “A record negative Greenland ice sheet surface mass balance rate in 2007.” Modelling support for the idea that the Arctic warming of 2007 impacted the ice. Don’t expect a different message from empirical studies ongoing, warmth melts ice. So on the ice-sheet that’s got the potential to melt rapidly there’s already mass loss. “Because of these contrasting behaviours – mass loss in coastal regions and mass gain in elevated central regions – ice-sheet mass loss exceeds mass gain only slightly,” the Toulouse-based researcher said. So we know from work that Cazanave was personally involved in that Greenlands net loss is “significant”, not much doubt there, Greenland is losing and doubt will be about by how much. The pattern in Antarctica is more complex and on the whole it’s gaining (from that abstract). It remains your bias that reads into the quote the notion that there is real doubt about that general picture. Obviously the doubt about absolute levels of net gain/loss from Antarctic/Greenland will compound, making the overall impact on sea level rise even more doubtful. That is what leads to the “great uncertainty” with respect to sea level rise contribution. Then of course you should remember that the data showed an annual loss equivalent to 75,000 sq kl of 2-metre thick ice. I put it in that format to remind you that the rate of build is such that 1,000,000 sq kl MORE THAN LAST YEARâ€™S RECORD will most likely form this year. What you mean there’s a cooling concentrated in the southern hemisphere (Ocean related)? CRU / GISS. And at the same time the Antarctic sea ice is growing larger! Like WOW man simply AMAZING. What? See that you really need to start being truly sceptical instead of indulging in pseudo-science? Yes that point has been made over and over, starting with your hook-line and sinker swallowing of Watts’ and his inability to compose graphs correctly. Have a look at the Canadian satellite sea ice report: as I write the current map is for 22 June. Looks like the NW Passage could be open reasonably soon – just a chunk of ice in the passage west of Baffin Bay and to the north of Alaska, otherwise it’s broken ice or open water. I agree, the NW passage will be open once more this year, and it could be soon. The HRPT visible images are getting largely useless because of cloud. IR are useless at this time of year because all they see is emission from water vapour. However there are some breaks in the HRPT visible and there are tantalising glimpses of a lot of broken ice / surface melting in the Chucki/Beaufort region. That said, the current thinning in that region seems to be less than last year – AMSR-E (That’s essentially the same as Gareth’s link, but you can go back to previous dates.) And last year’s melt really took off in July due to weather that’s likely to unique to last year. From Gareth’s above link, the Sea Ice Extent Anomoly Map shows a negative anomaly near the pole. Once again I’m not at all sure which way it’ll go. Fingers crossed it’s above last year, the slower this process the happier I’ll be. CW. You first few paragraphs are wasted as I was talking about Antarctica, not Greenland. And as you point out, ice mass is growing as it’s getting colder. This was a point I’ve been trying to get Gareth to understand. And another display of your petulance and sarcasm. Did you know they talk about you on forums when you’re not even there – and not in a good way? Mr Watts didn’t compose a graph wrongly, he mistook “up to 300mb” as up from the surface. What you mean like back on the Science forums Harry? Well with scant science to discuss social chat is all that’s left. So I’ve riled some denialists? Good! Mr Watts composed a graph at 300mb height, and presented it as a tropospheric observation – if not wrong what is that? Correctitudinally Challenged? It took me less than 1 minute to figure where he’d gone wrong. PS AFAIK because Antarctica is complex there is disagreement about whether there’s net loss or gain. That’s why I specifically referred to that abstract saying net gain (note my wording I was careful to specify reference to the abstract). In any case because it’s not all going to go at once (due to that complexity) the local picture in places like WAIS is crucial. PPS Greenland is relevant to Casanaves quoted statement. “Russian army trains for Arctic resource war.” Canada’s Financial Post, more here. Is it clear that things are generally cooling where the Antarctic sea ice forms (for the most part rather distant from the mainland)? Regardless it would be important to know what’s going on with both air and water temps. IIRC there’s a paper demonstrating that more snow (from warmer air) has the effect of increasing the sea ice a bit. I find this UIUC plot to be the most useful one for keeping the Antarctic sea ice changes in perspective. Re the Arctic sea ice, if it’s the case that the warming currents are the main thing going on then the weather becomes less important. Combine that with all the thin ice and we can see why the NSIDC scientists are openly predicting a new record. They’re actually pretty conservative folks in terms of their public statements. CW. Wrong, my friend. Harry’s older (and smarter) brother! And I’ve never been on the ‘Science’ forums. I was on the BBC’s Weather (The Environment) forum, and they used to talk about you on there when you were stumped by a contributor and couldn’t answer his very simple question. Antarctica is net gain, it’s a simple bit of mathematics. Antarctica is net gain, itâ€™s a simple bit of mathematics. You have to learn to distinguish between sea ice, and continental ice sheets. The sea ice around Antarctica might – or might not – set a record extent later this year. The continental ice mass balance is, however, likely to be negative. From GISS (plot) Last year there was significant cooling reaching into the ice covered area. I’ve not read anything suggesting the cause of the increased sea-ice area in the Antarctic. However it really shouldn’t be a surprise on the most basic level as there is a notable cooling of the southern hemisphere which is centred on the oceans. If I was seriously interested in a mechanism I’d be looking at a whole lot more. And given papers like Toggweiler’s study of winds at the LGM, southern hemisphere cooling due to ocean current changes (due to wind changes) would not be an unreasonable outcome. 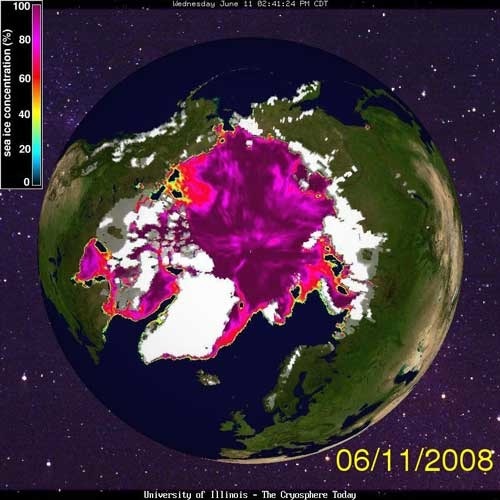 PS have you read Perovitch “Sunlight, water, and ice: Extreme Arctic sea ice melt during the summer of 2007” abstract. I’m probably not as up-to-date as you are (the Antarctic is not my back-yard), I may well be working off a superseded reference in the abstract above. Note that Domingues only goes up to 2003, the hemispheric air temperature differences seem to me to suggest a real cooling blip at present. At the end of July last year there was a lull in ice extent build in the Antarctic. If we don’t get any pauses this year, and ice builds as fast as it has been so far, then the totality in September is going to be truly significant. Wait and see. To CW and Gareth, as I point out, ice build in ‘sea-sheets’ is actually more than ice lost on the western side, so there is overall net gain at the moment. I really cannot make it any plainer for you both. To CW and Gareth, as I point out, ice build in â€™sea-sheetsâ€™ is actually more than ice lost on the western side, so there is overall net gain at the moment. Okay. The ice lost from Antarctic’s mass was almost all on the Western side of the continent (according to GRACE back in 2006). However, the ice extent built since in sea ice around the continent more than outweighs that loss. As I already pointed out above, “…the data showed an annual loss equivalent to 75,000 sq kl of 2-metre thick ice…the rate of build is such that 1,000,000 sq kl MORE THAN LAST YEARâ€™S RECORD will most likely form this year. Do you see now? How is that Gobbledegook? You’ve already shown that you cannot understand how sequestered carbon dioxide is released immediately when a tree is burned, against slow release when left to rot, so I perhaps don’t hold out too much hope that you’ll understand the above. Could I recommend a crash course in basic science Gareth? Sid, why do you want CW to waste his time on another one of Watts’ wackaloon flights of fancy? For that matter, why do you want to waste your time? Remember how you took the bait on the water vapor? Here we go again. From now on, only serious responses will be replied to. Steve. Actually I read it first on PhysOrg.com, so it’s not “one of Wattsâ€™ wackaloon flights of fancy” at all. Try growing up Steve, there’s a good chap. I wanted CW to reply at Mr Watt’s site rather than reading it at PhysOrg because there are some interesting replies. The paper and its findings are quite real and interesting. The implications for global warming are zilch, which is where the wackaloon flight of fancy comes in. Of course AW, having been told why this sort of thing is irrelevant to AGW (see his prior posts on Antarctic vulcanism), is now more subtle about it. He can be confident that people like you know just what to do with the information. Wrong Mr Bloom – again. Mr Watts makes no direct implication from it, and neither did I, merely offered it up to get a reaction and, as I said, a genuine opinion. Pity you couldn’t offer a sensible opinion on it, rather than a rather childish reactionary one. Oh, but I see, this is an *indirect* implication. Clever Sid! Does that pass for erudition at your institution? I came across it elsewhere last night, it is interesting, I genuinely mean it! But it’s not relevant to the Arctic “environment” as in the ice, and the regional warming. The area is well away from the seat of action in the Arctic (Chucki/Beaufort Sea), and as there’s an ocean net heat flux of 3.8T Watt through the Fram Strait (between Iceland and Greenland) with 2.3T Watt through the Bering Strait, both into the Arctic#. It’s not going to matter much in terms of the Arctic ice melt. I do agree with Steve. Just rewind to Watts’ Tropical water vapour posts. Had I done them I would have noted that models give good agreement with measurement of total column water vapour (e.g. Soden’s work on Pinatubo as a test of both modelled WV feedback and the assumption of relative humidity). The measurement of total column water vapour is more accurate than that of levels in the atmosphere. Others might see other reasons for caveats, such reasons are out there for the blogger seeking to inform. Watts’ stance and the general content of his blog that doesn’t lead me to think he is posting that out of interest, especially in view of where the volcano is. How many of the other recent undersea volcanoes elsewhere in the world has he covered? # Re Arctic regional heat fluxes and more: See slide 8 of this (pdf 3.91Mb) 2008 presentation by Maslowki re Arctic Basin heat fluxes. Antarctica’s Sea ice; you melt 2 metres of it and you have dark ocean, also the underlying water is excellent for storing and distributing heat. Antarctica’s continental ice cap; you melt 2 metres and there’s more ice, the relative immobility of the underlying ice makes it much less effective at storing and re-distributing heat. That’s just one reason why the change in sea ice is not relevant to Antarctic ice sheet mass balance. Mr Bloom. Now you’re getting it, you’ve learned the difference between direct implication and indirect implication. The next thing you have to learn is atmospheric science. While the troposphere does warm as a function of increasing GHGs, the maximum change is not at the surface, but actually in the mid-troposphere. And there’s your problem. CW. Thank you. Yes, Mr Watt’s site was crashed. It’s going to be interesting to see if Mr Maslowki’s ice-albedo feedback is correct. Ice Albedo feedback is correct, ice reflects more light than sea. BTW Serreze et al explicitly say the ice around the pole may fare better than one might imagine. That’s because of the low angle of incidence of sunlight. Here is a plot of data from the current N Pole Webcam, note incoming shortwave, about 200Watts/m^2. Tropospheric temperature is surely off topic on this thread, unless you want to discuss the Arctic in that respect. However I do hope you’re giving due weight to the error ranges of the data you use to make that claim. Could I recommend a crash course in basic science Gareth? 1. The Antarctic sea ice and the grounded ice on the continent – the ice sheets – are different systems that respond in different ways to different things. 2. A tree grows. It takes carbon from the air. I coppice it and burn the wood, the carbon returns to the air. Meanwhile, the coppiced tree regrows and takes more carbon out of the air. The rate of release or fixing has nothing to do with whether the burning of the wood is carbon neutral or not. As long as I replant/regrow enough trees to cover my annual use, I am carbon neutral in that respect. This all pretty basic stuff. Sid, unless you can demonstrate a slightly better level of understanding, I will be forced to treat you as a troll. They don’t get fed. Here’s Nature Reports: Climate Change on the Lawrence et al paper, and other relevant recent work. Gareth. As you go about your lifestyle you emit carbon dioxide. I have no idea what that amount is, but let’s say it’s 52,560kg a year – 144kg a day. Okay, so you emit 6kg an hour. But you plant trees so that they soak up 6kg an hour. You are carbon neutral. However, you then come along and coppice the trees and burn them. So you’ve reduced the ability of the collective of the trees down to say 5kg (so you’re no longer carbon neutral) but worse, you’ve just re-emitted all that sequestered carbon dioxide. If you had let the coppicing rot then they would have slowly released it – AT THE SAME TIME that the trees put on extra growth due to the coppicing, so that would have been neutral. But you burnt it – thus releasing all the previously sequestered carbon dioxide in one short hit. All you’ve done is release all that you captured to offset your emissions. Do you see now? Gareth, calling someone a troll (or saying they are cherry-picking) is just daft webshite. It belongs to web-chat in the 1990s on forums where two sides argued unendingly and wouldn’t see both sides of a debate. I hope the internet has moved on, and I hate both “troll” and “cherry-picking” (not that you have used that, of course). In my thinking on climate change I can genuinely see both sides of the issue, and genuinely feel sorry for those that can only see one, for they are missing so much. There’s lots I don’t know. The trouble is there’s lots other people don’t know too! CW. Excuse my ignorance if I have this wrong, but does that data come from a drifting buoy? All youâ€™ve done is release all that you captured to offset your emissions. Only if I coppice the whole lot – which would be remarkably stupid. I will coppice enough (on a 10/12 year rotation) to get carbon neutral space heating. But as I will I have planted many more trees than required to meet my heating needs, I will cover a great deal more than just that. As for the “troll” bit: I suggest you ask interesting questions, and drop the bumptious rudery. Or you’ll just get ignored. Yes, it’s a buoy, you can see it’s path if you scroll down the page. Troll / Cherry-picking are actual terms with definitions. Isn’t it more a surface mounted weather station that drifts with the ice? If you look at the pix at that page you can see it’s beginning to lean over as the underlying ice melts. Technically yes, that’s how I see it Gareth. But it is referred to as a bouy on their site. If you check the definitions page – “This buoy uses lithium batteries to power the buoy itself…” Re-reading Sidney’s question I should have been more precise. Thanks for the Nature link. By now it’s getting such that short of the ice releasing Cthulhu or Godzilla, nothing seems to make it worse than it already is. Actually if Godzilla were to be released I’d be OK (I don’t live in New York). So Cthulhu is my only worry. Here’s what I was basing my “Antarctic losing ice mass” statement on: a Nasa press release about Rignot et al, Nature Geoscience, Feb 2008. Between 1996 and 2007, Pine Island Glacier sped up 42% and ungrounded over most of its ice plain. Smith Glacier accelerated 83% and ungrounded as well. Their largest speed up are recorded in 2007. Thwaites Glacier is not accelerating but widening with time and its eastern ice shelf doubled its speed. Total ice discharge from these glaciers increased 30% in 12 yr and the net mass loss increased 170% from 39 Â± 15 Gt/yr to 105 Â± 27 Gt/yr. Longer-term velocity changes suggest only a moderate loss in the 1970s. As the glaciers unground into the deeper, smoother beds inland, the mass loss from this region will grow considerably larger in years to come. The team found that the net loss of ice mass from Antarctica increased from 112 (plus or minus 91) gigatonnes a year in 1996 to 196 (plus or minus 92) gigatonnes a year in 2006. I may be reading this in the wrong way, but “112 plus or minus 91) gigatonnes” means to me that the loss could be 21 gigatonnes OR 203 gigatonnes in 1996! Same applyes to “196 (plus or minus 92) gigatonnes a year in 2006”. This seems almost worthless as a meaningful measurement. Is that the right way to read it? Antarctica is still losing mass of course, but these margins of error seem to have the possibility of overlapping amounts for the years 1996 and 2006 i.e. 2006 amount could be less than the 1996 amount. I’ve not properly read this yet, just sped though it: “Winter Arctic Sea Ice Uncertainty Under Global Warming due to a Cloud Radiative Feedback.” Abbot/Tziperman. pre-print. They’re proposing that clouds could provide an additional winter warming that we cannot predict. Antarctica just gets colder and colder. Ice extent now running at 1.5 million sq kl, from 1 million sq kl just a few weeks ago. Will smash last year’s record. Meanwhile the Arctic still hasn’t dropped into the predicted free-fall. Ice extent running ahead of 2007’s. Gareth, your link is 1-2 years out of date. Most ice loss was in the west on the Peninsula. On the east it is gaining http://www.physorg.com/news4180.html. The interior meanwhile is gaining (due to increased precipitation?). It’s getting colder in the Antarctic, and has been doing so for very many years. Deny all you like friend, the planet just ain’t warming any more – and more reports this week of a global cooling ahead. Oh dear! The problem is reports like this http://news.nationalgeographic.com/news/2008/01/080114-antarctica-melting.html This seems to suggest that Gareth is right, but when you read it you find that it refers to a COASTAL survey and actually reports on the Peninsula. Just rotten journalism really. Not only that, but this issue is indicative of what’s rotten in the state of warming. When increased precipitation is reported, up go the cries from the Warmists. “Yeah we knew that. That’s in our models. More warming means more snowfall”. Then when some ice loss is reported, up go the cries from the Warmists. “Yeah we knew that. Antarctica is warming, the seas will rise, and we’ll all go to hell”. Let’s have it all, shall we? The NG story is reporting a paper – and quite accurately it appears. Hardly “rotten journalism”. Do you not like it because it confirms increased rates of melting in the areas it studies? Again, Sid, you seem to be struggling to comprehend the way ice sheets work. It’s perfectly possible for snowfall to increase in the middle of Antarctica, and for melting to increase at the edges. If the melting exceeds the snow accumulation, you get mass loss. If it doesn’t, the ice sheet grows. Virtually all the current work on Antarctica suggests that the ice sheet is losing significant amounts of mass. It really is odd. Thanks. Gareth, you miss the point. I provided the link with an ‘old’ story, because you did! What I mean about rotten journalism is the impression it gives – that Antarctica is losing ice mass. It isn’t. It cannot, when it’s getting colder and colder down there. Only the Peninsula and part of the west coast is getting a bit of melting. You seem to be struggling to comprehend a simple sentence. Again then: Ice loss in the west; ice gain in the east; ice gain in the interior. Overall: Ice gain. Rignot used satellite observations of Antarcticaâ€™s coastline to estimate melting, but he compared this actual data to computer models of Antarctic interior snow accumulation. So the western Antarctic appears to losing mass, but only when compared to computer models! Sid, you seem unable to accept the facts. Current research suggests that the Antarctic is losing ice mass. Of course it’s possible to dredge up old papers that suggest something else, but times change. If you want to comment intelligently on what the IPCC actually says, go read AR4 4.6.2.2.2. And then remember that it doesn’t include the latest research. That I linked to. Ah Gareth, you do not see a point made very clear above. Let me try again. The IPCC says that Antarctica will GAIN ice because of increased precipitation due to increased water vapor – that’s what the models say. But you are saying that the study that suggests it is LOSING ice is correct because it’s the “latest research”. This is exactly what I was talking about earlier – you cannot have it all. Either the models are wrong (again!) and Antarctica is losing ice (despite a plunging temperature!) OR the study is wrong (and the models are correct) and Antarctica is gaining ice. Which is it Gareth? It’s either getting colder and gaining ice mass, or it’s getting warmer and losing it. Look forward to your reply with great interest. Itâ€™s either getting colder and gaining ice mass, or itâ€™s getting warmer and losing it. Look forward to your reply with great interest. Didn’t think you’d ever answer it – not at all surprised. Let’s make it simple: Gareth, is Antarctica getting colder (last few decades), or warmer? And remember, we’re talking about the continent as a whole, so no weasling by mentioning the Peninsula when it makes up only 4%. Gareth. Yes I quote that web page above (didn’t you notice? ), that’s where the quoted paragraph comes from. Sheesh! Are you going to answer it, or shy away? Is Antarctica getting colder, or warmer? Ooer! Arctic ice extent still not plunging. Rate of fall slower compared to last year, and getting on for 1,000,000 sq km ahead of last year’s too! Meanwhile, the Antarctic is heading for 2,000,000 sq km more ice extent than 2007’s record high. Brrr! That’s it Sidney, put on the blinkers, ignore what’s awkward, and focus on the evidence that makes you feel nice. Do you really think you’re telling anyone here anything they don’t already know? It’ll be interesting if Bitz’s 1 year lag auto-correlation rule holds, but it won’t change the fundamentals. BTW you haven’t specified what part of Antarctic Gareth should provide temperature trends for. Antarctica: Some bits are warming, some bits are cooling. Some bits are gaining mass, others are losing mass. Overall, it’s losing mass. Sea ice extents. Don’t know where you get your “million km2 behind” for the Arctic from. CT suggests it’s about 0.25m at the moment, and we’re heading into the peak of the melt season. All bets are still on. I would’ve thought ‘volume’ matters a hell of a lot more than ‘ice we can see from above’ (square kilometres)? Gareth. Can’t believe it – you still haven’t answered! I thought that even you would be shamed into answering a simple question by now. Yet again then: Is Antarctica getting colder, or warmer? Note this question doesn’t allow you to pick and choose regions (as I made absolutely clear earlier!). Neither does it talk of mass. It’s purely a question of the temperature of the continent overall. CW. Blinkers?? That would be you and your friends, I think! Sid, you’re becoming boring. If you want to play silly games, go somewhere else. So no answer then? Speaks so loud. Thanks for your blog and for hosting this discussion, it was very useful. You know my email, if Steve Bloom wants mine you’re free to divulge. Sidney, looking about it seems that surface and near-surface trends in the Antarctic aren’t statistically significant for the most part. Data coverage is sparse, too. But weren’t you originally trying to make some point about Antarctic sea ice? Southern Ocean sea surface temperatures would be more relevant for that I would think. Fragment. Yes you are, of course, correct. The temperature in the Antarctic hasn’t varied much for a few decades. Although there’s a slight cooling, it’s not significant (just like the warming in the troposphere). And yes, I was indeed trying to get people to see that there will be a new record of Antarctic sea ice extent this year – could be a substantial increase on last year, which itself was a new record. Southern hemispheric temperatures are down considerably. I was just trying to get Gareth to acknowledge a truth – that the Antarctic isn’t warming. Title of the post I linked to as “says it all”: Antarctica is cold? Yeah , we knew that. Sidney, to be fair you threw a lot of other things at Gareth before you got to that question. I’d have got frustrated too. So you agree we can’t say much either way on the Antarctic surface temperature record given the data we have. GRACE shows recent mass loss of the ice sheets – I know you question it, but I’m not aware of any better estimates of ice sheet mass. Antarctic sea ice has been increasing for 30 years or so, but it’s really not that dramatic an increase compared to the variability in the data – check the SH ice anomaly graph on Cryosphere Today. Overall there’s not much to base an argument about Antarctic temperature trends either way. To be honest I think it would be better to take a detailed look at the dynamics of the Antarctic and Southern Ocean rather than try to make points based on sparse and recent datasets. I’m unfortunately ignorant on that score. There’s an interesting post on Open Mind about sea ice. Fragment. I certainly don’t accept that I threw anything at Gareth he didn’t deserve (re: coppicing). The ‘problem’ of the Antarctic and the cooling southern hemisphere isn’t going to go away for the Warmists, even if the Warmists do (Cobblyworlds has gone – again! Pity, because I was looking forward to the non-story of Arctic melt unfolding). There’s certainly no warming going on in the Antarctic overall. I abhor the type of analysis on that link you give. How can we compare HadISSL data which is so sparse with today’s satellite records? As for the Antarctic ice extent, well it’s still early days. If we don’t get a pause in late July or so, then I still say we’re going to see a significant new record. And what of the Arctic – should have gone by now – much the same as Cobblyworlds. Gareth. How exactly can I forget that you live closer to the place – and what difference does it make??? And as I said, I quoted from that very site before you did! Since I thought much of what you threw at Gareth didn’t make much sense, I don’t agree that he deserved it. But let’s not rehash that, you brought the conversation down to a simple question that we can at least attempt to agree on. With respect to that I notice that you’ve gone from “the Antarctic just gets colder and colder” to “the temperature in the Antarctic hasnâ€™t varied much for a few decades” and “thereâ€™s certainly no warming going on in the Antarctic overall”. Do you think this conversation might have gone better if you’d omitted the former claim? Ignore the HadISST if you like and look at the satellite data alone (graphed in red on Open Mind) you can see that the Antarctic sea ice extent over the satellite period isn’t doing a great deal either direction, whereas the Arctic shows a dramatic decline. Same thing you see in the Cryosphere Today graphs, I mainly pointed to it because the smoothings been done. Point is a record sea ice extent in the Antarctic isn’t that big a deal given the variation in the data. Interesting, but it hardly brings down climatology. When you focus this much attention on a weak point I have to wonder if it’s because you haven’t got anything better. Can you point to data for “cooling Southern Hemisphere”? Maybe you already did, but I didn’t see it in a quick overview of the thread. Fragment. My point on “colder and colder” was that it defies ‘global’ warming. The rate of cooling isn’t much, but it’s there nonetheless. I know what would be happening if it were warming, witness all the coverage that the Peninsula gets! With hindsight, conversations would always go better! Nothing better? Fragment, the problem is that sceptics won’t accept that carbon dioxide appears to have warmed the globe in the past 30 years or so. Neither do they tend to accept circumstantial evidence of receding glaciers and expanding oceans. However, Warmists (as displayed here) won’t see the other side either. They won’t see the Antarctic not warming, they won’t see the troposphere not responding, they won’t see a slight fall in sea levels (meaning oceans cooling), and as of late, they won’t see the global temperature apparently stabilised. I cannot see why people cannot see both sides!!! Carbon dioxide has NOT raised global temperature anything like we all thought it would. It’s time to accept that and learn. Yet on here you seem to have all the doom-merchants that are prevalent on so many other blogs. When one thing isn’t responding as they thought, they move on to something else. Look at the other threads here on the Arctic also. It’s my ‘guess’ that the Arctic won’t melt like last year. And when (if) it doesn’t, Cobblyworlds, Steve Bloom and Gareth will move on to something else that they can find to worry themselves about. The fact is that the world IS NOT, or perhaps no longer, warming up. 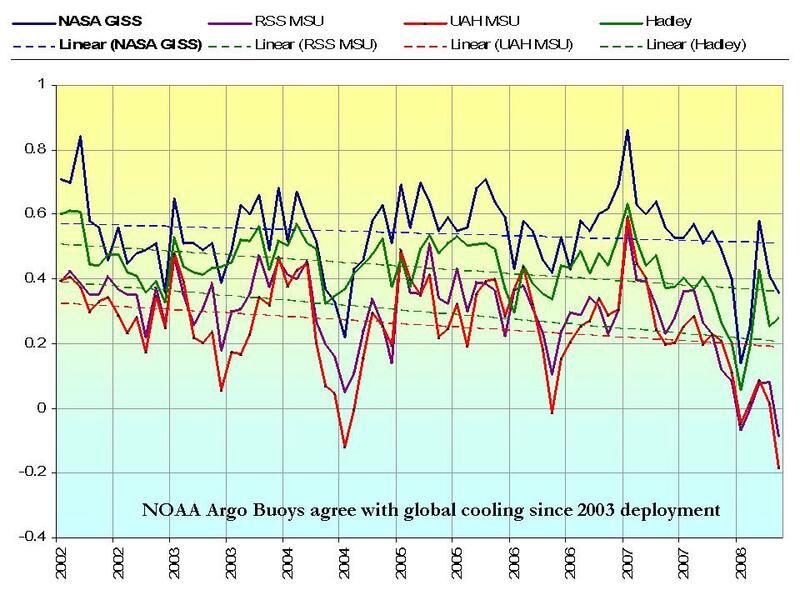 You can look at all the graphs from UAH, RSS and CRU showing such (GISS is a joke). I think it’s time we accepted that many of the alarmist claptrap that was/is spoken is binned. For reasons we don’t and cannot understand global warming has turned out to be overstated. For a dose of realism I can strongly recommend this site http://www.climateaudit.org/ The latest graphs are near the top – part of a new thread on troposphere data. Fragment. Is this the strangest hockeystick you’ve ever seen? If the statistics are insignificant, then you can’t say the cooling is there. That’s what insignificant means – you can’t draw a conclusion from the data. It’s really twisting things to say “colder and colder” is compatible with that, and it’s also twisting things to say and insignificant Antarctic cooling trend “defies global warming” “Global warming” is simply a description of trends in mean temperature anomalies, which can still be positive even if some of those anomalies are negative. You’re statement “colder and colder” still looks like hyperbole unsupported by the actual data to me. I’m sure you’ve accused “warmists” of doing that at some point (possibly accurately), so pot, kettle, etc. And what do you mean “warmists” won’t see various things? I’ve seen all those things discussed a number of times, with the exception of sea level (and the link you provided for that appears to be no more than a year-long departure from the trend so far, and not wildly out of line with previous departures). The disagreement isn’t one of awareness of or acknowledgement of the data, it’s about whether those things are actually dramatic blows against mainstream climate science. CRUs not working for me right now. And yeah, that’s a mighty strange, and nearly data-free, climate reconstruction! Fragment. On your first sentence. This is a miss-take on what we perceive as warming/cooling. I (and others) go by a method whereby if the temperature goes up, then it’s warming. If it goes down, then it’s cooling (continuous data streaming). This is because otherwise you have to have a time to choose when to set your standard against. GISS use a period of global cooling to set their baseline – 1951-80. So the Antarctic IS cooling. It may be “insignificant”, but it’s there. So my comments on the Antarctic are perfectly valid. Same for the Antarctic and global warming. Fragment, the Antarctic (by the BAS’s own description) is “a barometer of global climate change”. They said it, not I. So if the Antarcic defies that change then there’s something wrong somewhere, isn’t there? That’s wrong. It’s nothing to do with baselines, which are arbitrary and don’t affect trends. Statistically insignificant in this case means that we can’t reject the null hypothesis that there is no trend whatsoever and the observed data is just a consequence of random variation. As far as I can tell (from e.g. the RealClimate piece already linked) no-one’s expecting dramatic warming of the Antarctic as a whole at the moment. If you can find some GCMs that say there should have been warming in the Antarctic for the last couple of decades, then you can start saying there’s something wrong. Fragment. Think about it for a second. Imagine the Antarctic was warming significantly. Do you believe for one second that Warmists would say, “Oh actually, that’s incidental, and nothing to do with our theory”. Of course not. They would be upon it as proof of their theory. Temperature in the Peninsula of the Antarctic is seized upon by Warmists as part of climate change. Like I have said, they cannot have it all. The rest of the continent is ignored. And again, it was the BAS that has said that the Antartci is a “barometer of climate change”. Well then something’s wrong with the barometer. Motl says today, “In terms of the anomaly, the land in the Southern polar lands – Antarctica – cooled by a hefty 2.35C from the previous month – from +0.82 to -1.53C. Such things happen near the poles where all changes are amplified and where the area is not too large to guarantee a constancy of temperature.” Indeed, Warmists have seized upon the Arctic 2007 melting as an indicator of man-made climate change. Again, wrongly in my belief. So it’s not simply a case of “show me GCMs”. ANY warming ANYWHERE is taken as part of climate change, just as ANY weather event ANYWHERE is taken as part of climate change. Motl again: “Thereâ€™s no global warming in the recent 10 years of data. This absence of warming becomes even more striking in the middle troposphere where the bulk of the greenhouse effect is being predicted while the reality shows an even slower warming trend if any. In fact, the trend since 1979 is 0.00C per decade on the Southern Hemisphere and 0.05C per decade globally, justifying the claim that there exists no satellite-observed global warming in the mid troposphere. Fragment, there simply isn’t any warming anymore. Or rather, the warming that we thought we would get from carbon dioxide simply hasn’t happened. It’s very plain, and very obvious. Just as obvious as the fact that the Arctic isn’t melting in 2008 – despite all the hot air from messrs Cobblyworlds, Bloom and Gareth. Quoting Lubos Motl as an authority? Forgive me if I ignore his – and your – rants. Actually, if the Antarctic as a whole was warming significantly and dramatically, I’d be saying there’s something that GCMs aren’t modelling very well. I don’t claim any weather event anywhere is due to the enhanced greenhouse effect, and I’m not alone in that, so take your strawman somewhere else, please. As I understand it, the middle troposphere in the tropics would be expected to warm more than has been observed no matter what the forcing, so the satellite data is actually inconsistent with ground observations, although the errors in the reconstructions from satellite data might be wide enough for that to be not much of an issue. It’s an interesting issue, but not fatal to mainstream climate science. Where did the BAS say the barometer thing, by the way? Googling that quote mostly gets me a guy from Ohio quoted in articles about Greenland. Fragment. I don’t care whether you claim weather events as warming or not, my point was that generally, Warmists do, so it’s not a strawman at all. Please keep such terms as ‘strawman’, ‘cherry-picking’, ‘troll’ etc. back in the 1990s web-arguing where they belong. Your troposphere comments are amusing. So what of radiosonde then? That’s in error too, I suppose? Oh come on Fragment, get real. The BAS quote was said by them when I used to argue all this on the BBC weather boards about three years or so ago. I can genuinely tell you that it was indeed a quote, and I used it often. I’ll spend a little time trying to find it – but not much! Gareth. Of course you’ll ignore Motl, I wouldn’t expect anything else! Fragment. What is actually your position on climate change? Balloon/rocket-sonde data is in error, but has recently been corrected, bringing it closer to the models (McCarthy 2008 J.Clim). Although uncertainty still remains. However as some people can’t even grasp the simple concept of timescale in climate science, there’s no hope they’ll grasp the issue of observational uncertainty, let alone the significance of good model match using metrics other than temperature. I agree CW, there’s no chance of people here even grasping climate facts as opposed to models, and then clutching at straws by saying “bringing it closer to models”. Let’s not let reality get in the way of a good model, eh? So let’s re-cap: Satellite data is in error because it doesn’t show the expected warming. Radiosonde data is in error because it doesn’t show the expected warming either. But the models are perfectly alright. I think I can see where you’re going wrong. Nice to see you quoting realclimate YET AGAIN! Do you read anything else, my friend? I’m going to say something that may hurt you…Gavin Schmidt isn’t God. No, really, he isn’t! I know, I know, it hurts, doesn’t it? Tell you what, there’s a realclimate piece on radiosonde data error on Aug 11, 2005. I’ve got $40 on it going to Oxfam that you’re going to use it. Satellite data is in error because it doesnâ€™t show the expected warming. Radiosonde data is in error because it doesnâ€™t show the expected warming either. But the models are perfectly alright. I think I can see where youâ€™re going wrong. That’s it continue to display your lack of grasp, and your lack of reading any of the threads of research in trying to resolve these issues. The data gets corrected because it needs to in order to be closer to reality. It just so happens that often brings it closer to the models. The models have loads of problems, but you continue to invent non-existent ones because you don’t get the problems that they really have (e.g. split ITCZ). As for Lucia’s erroneous piffle, well we’re back to comparison of trends on the appropriate climatological scale. If 1998’s EN were happening now I’d still see it as an ocean driven +ve bias unrelated to GHG forcing. Just as I see the current cooling as an ocean related -ve bias unrelated to GHG forcing. Schmidt’s not a hero, I don’t do heros. He’s a decent chap and a good scientist. Dont be daft Cobblers, you know full well that Sid would have read-up on the ‘problems’ of drift, and everything else, as have I. But it doesn’t cut it, does it? Funny how radiosonde comes up with almost the same figures…even though they both have separate ‘problems’!!! Like Sid says, it’s always best to blame the equipment, eh? Never any thought that the models and the very idea of CO2=warming could be wrong, eh? Wake up Cobblers for crying out loud. Something’s up with the base idea. And you do do heros (sic). You’ve been banging on about good ‘ol Gavin for years now. Realclimate is your bible, and everyone who’s ever run up against you knows it too. When the Arctic doesn’t melt, which cause are you going to go onto then? I’d like to know in advance. Let’s see now, you’ve done methane clathrates, water vapour, positive feedbacks (funny how they’re always positive, isn’t it?). So what’s going to trouble you next…when the Arctic doesn’t play ball? CW. “Cooling”. Cooling? Nice to see you admit that there’s cooling going on, and yes, it does appear to be as a result of ocean circulation. So, now you admit that we’re in a period of cooling, do you therefore accept that this is over-riding the pull of carbon dioxide? So, if (as) it is, then ocean circulation could also result in warming, couldn’t it? I mean there’s no reason to suppose it only ever results in cooling periods. We accept, of course, that 1998 was natural, and not part of the carbon alarm. So then, the Earth can scrub out what man can do, can it? And what about sunspot activity Cobblyworlds? Can that affect our climate? Realclimate is the site for anyone interested in what real scientists (as oppposed to pub-bore know-it-alls) have to say on climate change. Schmidt does most of the posts, hence I refer to him a lot. Anything else is in your mind Harry. Just because one year doesn’t follow another you both conclude there is no problem – you are wrong. The behaviour Bitz has noted has persisted throughout the ongoing reduction in extent. Had we listened to your faux-council on warming in 1975 we’d have had good reason to be very doubtful of your collective predictive skill. Just as you’d have been wrong in 1975, you are wrong now. You’re both just so impatient to declare some form of victory that you have jumped the gun. And you lack the clarity of mind to see it. From what I see there’s enough potential for “weather” variability to make this bet little more bounded than betting on pure chance. Which is the only reason I’ve not entered this particular fray to bet against William. on 16/5/08. I changed my opinion on 12/6/08 with a further clarification for Eli Rabbett. Having seriously dithered on 1/6/08. Now I’m back to not being sure what will happen, but I think it’s likely to be around last years’ figure. I change my opinion? Yes if the evidence demands I do. If you think there’s no chance of another record with almost 5 weeks of melt to go, you are using prejudice, not evidence & reason. My views on the cooling/warming-abatement are a matter of public record. And what about sunspot activity Cobblyworlds? Can that affect our climate? Sunspot changes are epiphenomenal of the processes that drive changes in TSI and solar magnetic field. This village is inflicted with a surfeit of idiots. Checking the logs for Hot Topic, I find that “Harry the Hat” and “Sid” are the same person, or at the very least posting from the same computer. This makes “Sid” Harry’s “sock puppet“, and I don’t approve. Harry/Sid: use only one identity when posting here, or you will be banned. This has been a public service announcement, on behalf of general sanity. Gareth, that’s a slur I’ll deal with. We use the same computer because it’s our business one! And we’re brothers – in case you hadn’t already noticed that I had said that. Yes, of course we support each other, but whereas ‘Harry’ is an out-and-out contrarian, I am a skeptic (not the same thing, even if people on here don’t seem to have the intelligence to realise that). So an apology is called for, but won’t be expected. And “general sanity”? Don’t make me laugh, there’s nothing sane in believing in a theory when you are not getting the responses that you should. CW. You admit that we’re in a period of cooling. So I’ll repeat the questions at risk of getting them answered. Do you therefore accept that this is over-riding the pull of carbon dioxide? And, the Earth can scrub out what man can do then, can it? A further one: Do you not link the Maunder Minimum with a lack of sunspots? One last one: Do you only ever believe that man affects the climate, and never nature/cosmic forces? “You admit that weâ€™re in a period of cooling. Admit???? I observe the facts. For a short period yes, the ocean can (for longer periods it could in the southern hemisphere). But at a price – a sustained greater degree of ocean heat-sinking will imply a smaller time constant meaning that although in the short term you get less warming than otherwise expected, in the long run you get the long-term impacts, like massive Antarctic continental melt more rapidly (a smaller number of centuries). It cannot stop the warming in the Northern hemisphere, which bothers me because that’s where most people live. It can mask but not stop the warming due to GHGs. I link the MM with a reduction in TSI leading to a cooling concentrated in the Northern Hemisphere (especially the N Atlantic Basin, seasonally mainly winter). The sunspots are merely used as a proxy for that process. A stupid question deserves another: Do you think there was an anthropogenic impact millions of years ago? But as it’s your last question I’ll also answer seriously: Of course natural factors can influence the climate, try the MM or Ice ages. But since the 1970s the single greatest impact on a multidecadal climatic scale (around 30 years – World Met Organisation) has been human activity, GHG emissions, but also particulate pollution, CFCs and land useage changes. Elsewhere here you’ve taken exception about Gareth pointing out that if CO2 doesn’t cause warming then physics itself is in gave crisis. Denying that shows you’re grasp of the physics is non-existent. You may as well tell me (BSc 2(I) Electronics) that the mathematics used in Fourier transforms do not atually bear a relationship to reality. If CO2 doesn’t have the potential to cause warming via infra-red blocking, then the very IR absorption based photometry that enables measurement of concentration doesn’t work. And it clearly does! I know because I have used an IR photometer. For the record; there is such similarity of langauge and poor reasoning between Harry Sidney that I fail to see why Gareth should apologise. It remains my opinion that you are one and the same. I can rely on my opinion for that at least, as if I am wrong it means nothing. CW. What I believe is that carbon dioxide has not resulted in the warming that we thought (Hansen’s Scenarios) we would get. Therefore, something is wrong somewhere. It really is as simple as that. And Cobblyworlds, me and ‘Harry’ are indeed two different people. I couldn’t give a flying * whether you believe it or not friend. I did think that Gareth might apologise, but what the hell? And you say, “Elsewhere here youâ€™ve taken exception about Gareth pointing out that if CO2 doesnâ€™t cause warming then physics itself is in gave crisis. Denying that shows youâ€™re grasp of the physics is non-existent.” Actually I didn’t say that, and again, it’s Harry that knows more about physics than I do, I’ll admit. I’ll return in September when the Arctic hasn’t melted – just to do some nose-rubbing. GISS temperature came out today, and continued the downward trend. It’s all over CW, you’ll not see any warming from now on. Like I said, carbon dioxide has not turned out to be the forcer we all thought. Expect a groundswell of the science community to turn upon itself in the next 1-2 years, you’ll see. When temperatures plummet, we’ll be wondering how we got hooked for so long.